This dresser almost didn't come home with me! Last week I went out with my friend Sam, and we were looking for furniture. 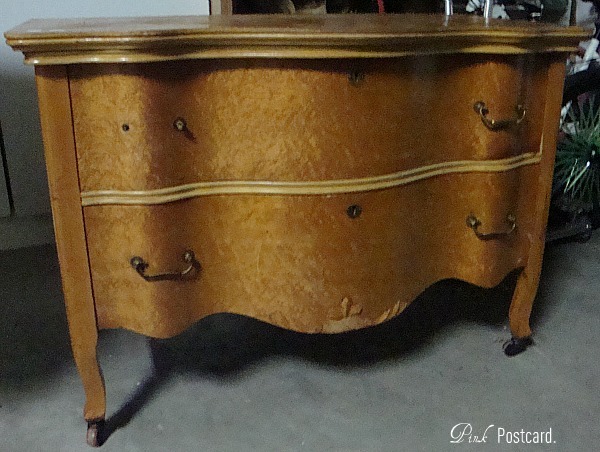 She found several pieces she liked, and I had looked closely at this little dresser before moving on. It certainly was an eye catcher, but the price seemed a little high for the condition it was in. But it kept staring at me, and by the time we were in the checkout I was still eyeing it. And then, as luck would have it, some one else started eyeing it. And then she called her husband over and they were giving it a good look. I told the cashier, "I want that dresser over there." Nothing like a little peer pressure to help you make up your mind! It got a French makeover. This was my first Annie Sloan chalk paint project. I used Louis Blue, and highlighted some key spots with Pure White and the dark wax. I loved the dark wax- it was a dream consistency and low odor. The clear wax I've been using is incredibly stinky, and this has convinced me to go back and get a can of the Annie Sloan clear wax. The top of the dresser was in terrible condition, and the reason why I almost left it in the store. 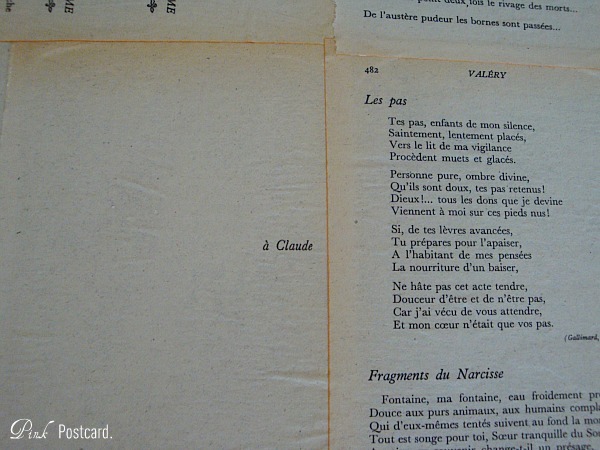 But, after I got it home, I remembered a vintage book of French poetry I had picked up a couple months ago, and decided the top would look great that way. 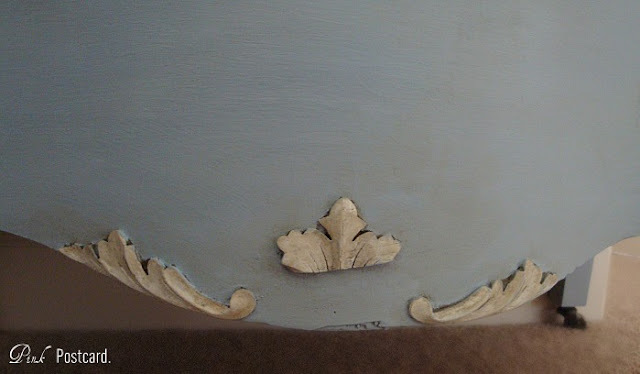 I also centered the page with "to Claude" in the middle of the top- which inspired the name to the dresser. It's a very feminine piece, so I added the 'mademoiselle' to it as well. I really love this one! Thanks for letting me share Mademoiselle Claude with you! :) If you are interested in this piece, check my Facebook page for updates on when it will be going to my space at Aunt Bee's. Ohhhh I am so jealous!!! oh that color AND those curves!!!! je l'adore! 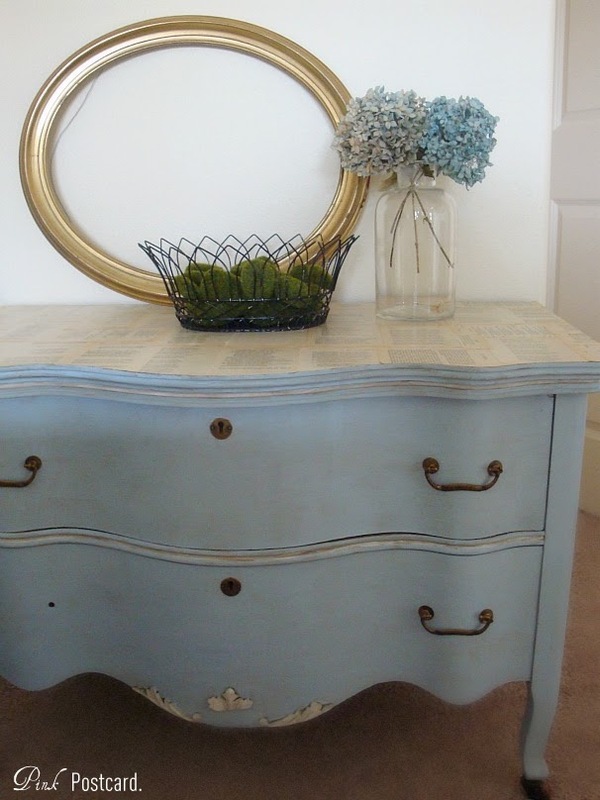 The lines of the dresser are so pretty and the color is perfection. You did a wonderful job! Your next piece, I know will turn out just as beautiful!! curv-a-licious!! and send me the width of that handle...i may have a match!! How pretty that piece turned out. I'm not sure I could part with it! I have yet to paint a piece with ASCP, but my kitchen chairs will be the first thing I tackle. p.s. I would love for you to stop by and sign up for my "Range" Christmas giveaway! Denise! I love your little blue dresser. It's very pretty! 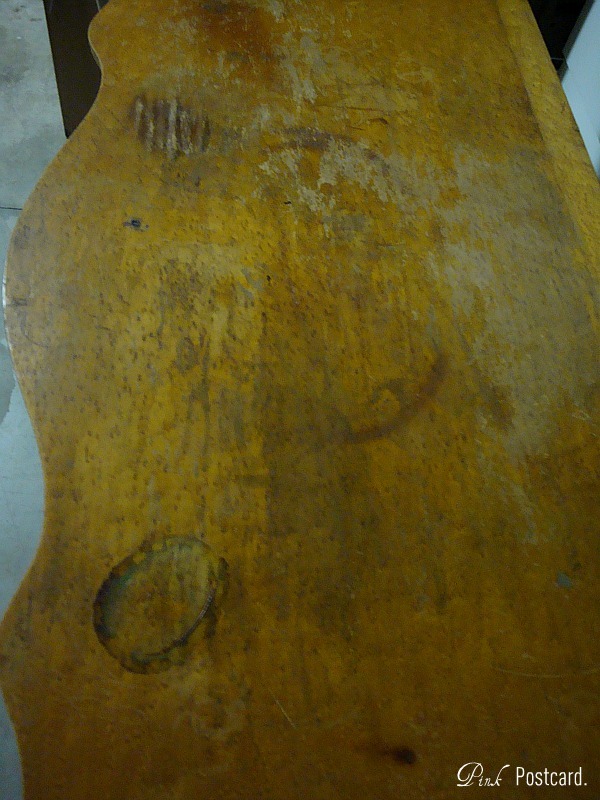 I did love that birds-eye maple wood, but it was in rough shape. It turned out fantastic. 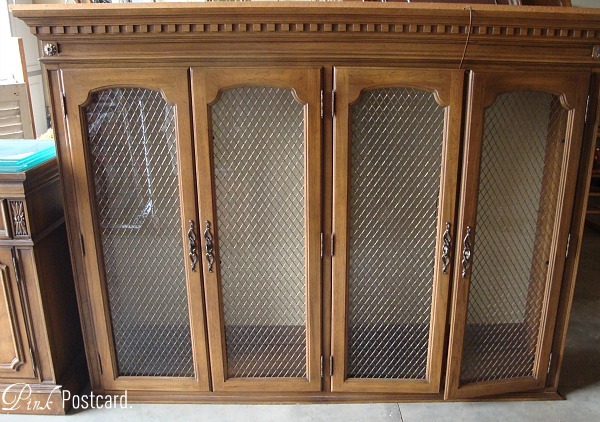 I love your cabinet too. Can't wait to see the end result! This turned out so beautiful! Love the curves and the book pages on top. Such a great color too! The dresser is beautiful! I love the color and the top is amazing...good job. You really brought it back to life. Nice job. So much better! I love the white details and the top! Awesome job! 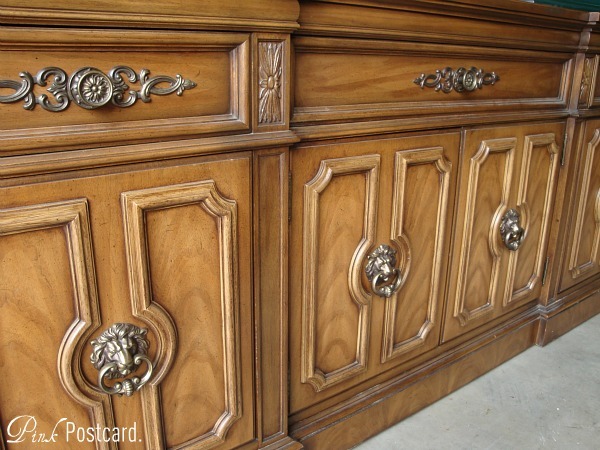 you did a fabulous job on this dresser! I love the color and the curves~ Good luck finding a pull to match!! Your dresser turned out beautifully. Love the color! Beautiful job! Love all frenchy things. 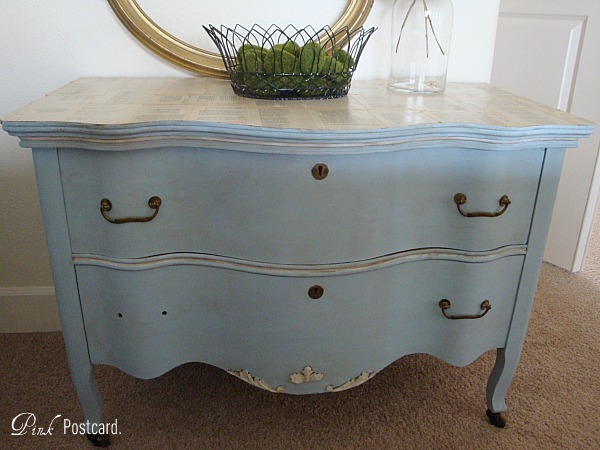 You did a beautiful job,love the color and the book pages added to the top and drawers. 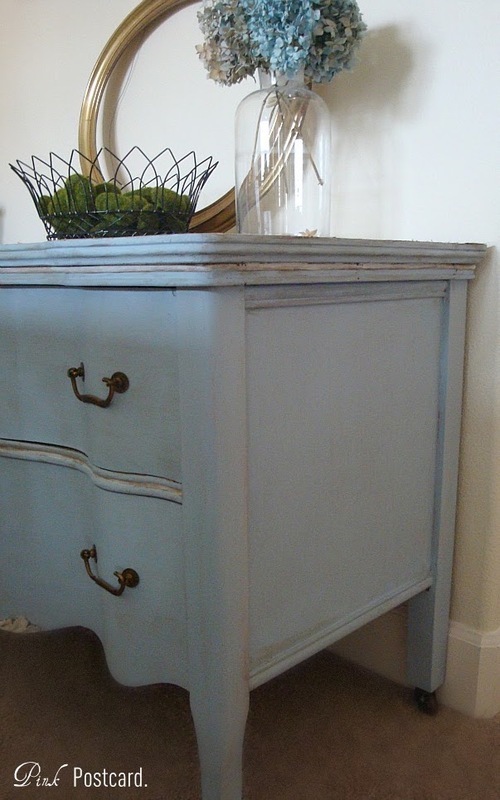 Hi - lovely work on this dresser (and very funny how you finally gave in and bought it after someone else was eying it!). 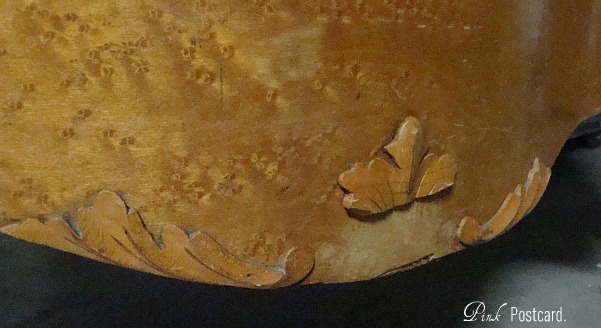 Was the piece all in bird's eye maple? That's what it looked like to me. I have a hard time sometimes painting over well done wood grained pieces (although I love painted pieces MORE!). Since I am a faux finish artist - I probably would have tried to do a faux bird's eye maple on the top (mainly because I love doing that woodgrain and it's one of the prettier woodgrains. Very feminine. I think). But when I see pieces that are oak, old mahogany or walnut - I am so ready to get rid of the woodgrain - and paint and antique them into beauty! 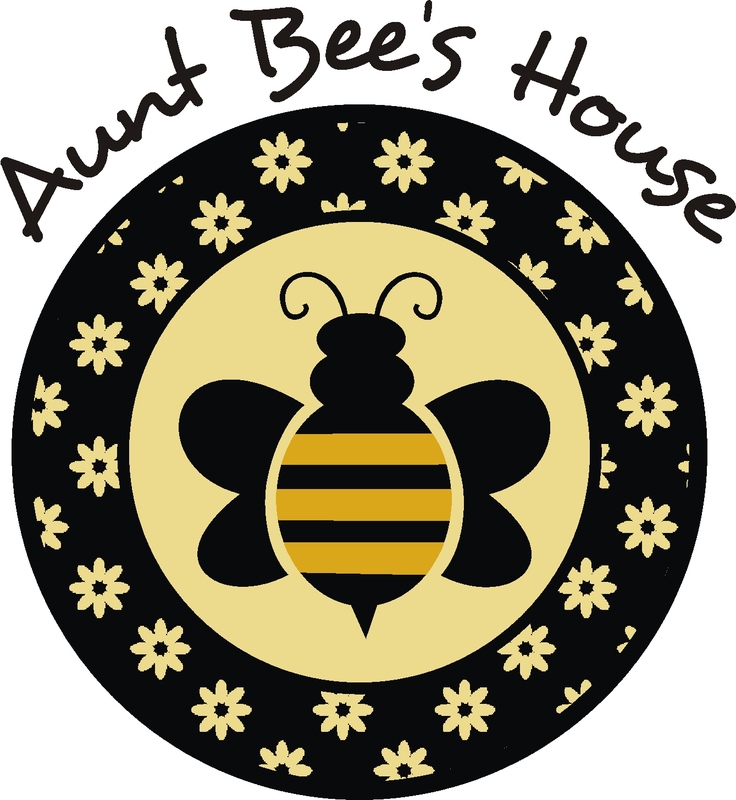 I am ready to revive my fruitwood dining room set with Annie Sloan Paint. My husband will probably have a fit - but I know the result will be so much more beautiful. I did a client's dining room set not too long ago with ASCP and it came out beautiful. I can see where the top of the dresser was a mess - and I love how you addressed it. That was brilliant! I'm not in love with the smell of any wax - even Annie's - but it does make a huge difference in the look and feel of the piece. Keep up the beautiful work you are doing. You're right, this is so much like the dresser I just painted! 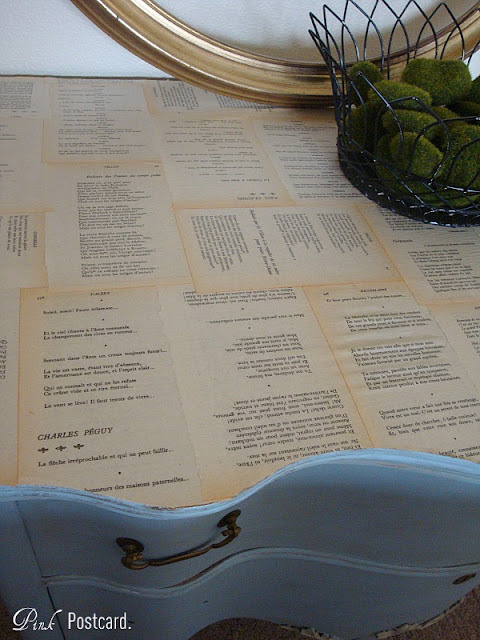 Love the color and the French poetry on the top! I'm your newest follower.